(Jean-François Picard, notice for France and the Americas, Culture, Politics and History, A multidisciplinary Encyclopedia, (Bill Marshall ed. ), ABC-Clio inc. Santa Barbara, 2005, http://ebooks.abc-clio.com/). French-trained physician whose medical career in the United States culminated in a Nobel Prize for physiology and medicine. André Frédéric Cournand was born in Paris on September 24, 1895. He studied physics, chemistry, and biology at the Faculté des Sciences in Paris, graduating in 1913. The following year, he began his medical studies, but upon the outbreak of World War I he volunteered for the French army, where he served as a battalion surgeon until the end of the conflict. On leaving the army, he resumed his medical studies and became an intern at the Hôpitaux de Paris in 1925. During the next few years he gained clinical experience, especially in internal medicine, under Professor Robert Debré, head of the pediatric service of the Children's Hospital in Paris. In the 1930s, anxious to study and work in the United States, Cournand secured a residency in the tuberculosis (later chest) service of Columbia University at Bellevue Hospital in New York. He became chief resident of this service and conducted research on the physiology and physiopathology of respiration under the guidance of D. W. Richards. Cournand also began his own work on the development of physiologic methods of exploration of the cardiopulmonary system. By using the catheter technique developed by W. Forsmann, Cournand and D. R. Richard Jr. succeeded in measuring the blood pressure in the lung artery. This discovery was crucial for the surgery of patients affected by silicosis, and eventually it was recognized by the 1956 Nobel Prize. During World War II Cournand was an investigator for the U.S. Office of Scientific and Research Development, working in the Chemical Warfare Service. Although Cournand became a U.S. citizen in 1941, he never cut his ties with his home country. Throughout his career, he stayed in close contact with his former teacher, Robert Debré. In the spring of 1945, as the war was ending in Europe, Cournand proposed a plan to the Rockefeller Foundation to assist French medical research. In 1947, with the support of the French government and the Rockefeller Foundation, a Medical and Surgery Relief Committee (MSRC) was established in New York to provide grants to French clinicians eager to learn the new techniques of biomedicine then in use in North America. The MSRC also provided scientific equipment (centrifuges) and new medicines (cortisone) to Louis Bugnard, director of the French Institut National d'Hygiène. In 1950, Debré attempted to lure Cournand back to France, where he could help with the renewal of medical research. When Debré suggested Cournand for a chair at the Collège de France, however, his candidature was blocked by academic rivalries. Cournand decided to stay in New York, where he was appointed professor at Columbia University's College of Physicians and Surgeons in 1951. A few years later, when Cournand was awarded the Nobel Prize as a U.S. citizen, Debré characterized this as "a severe warning for French medical research." 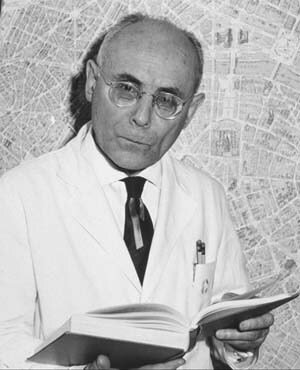 Professor André F. Cournand died in 1988.